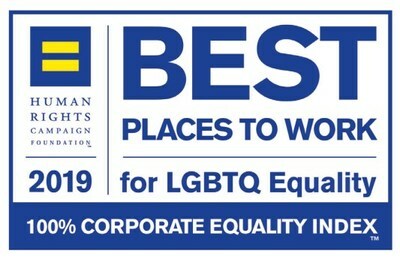 SECAUCUS, N.J., April 1, 2019 /PRNewswire/ -- Quest Diagnostics Incorporated (NYSE: DGX), the world's leading provider of diagnostic information services, received a perfect score of 100 from the Human Rights Campaign Foundation on the 2019 Corporate Equality Index, earning the distinction of being a "Best Place to Work for LGBTQ Equality." The Corporate Equality Index (CEI) is a national benchmarking survey and report on corporate policies and practices related to LGBTQ workplace equality, administered by the Human Rights Campaign Foundation. This is third year Quest has earned the designation as a Best Place to Work for LGBTQ Equality. "We are proud to once again be recognized as a company dedicated to being a top place to work for our LGBTQA employees," said Cecilia McKenney, Senior Vice President, Chief Human Resources Officer. "Our goals to promote a healthy world, build value, and create an inspiring workplace will only be accomplished by creating an inclusive workplace and attracting people from diverse backgrounds." The 2019 CEI rated 1,028 businesses in the report, which evaluates LGBTQ-related policies across business entities, equitable benefits for LGBTQ workers and their families, and supporting an inclusive culture and social responsibility. "Our Pride Network is proud to be part of a company where LGBTQ professionals and supporters can come together for sharing, networking, and volunteering," said James Humphreys, Vice President, Marketing and executive director of the Quest Diagnostics Pride Employee Business Network. "The strength of our diversity and inclusion helps us to achieve our vision of empowering better health with diagnostic insights." For more information on how Quest Diagnostics is meeting its responsibilities to shareholders, patients, employees and the world, download the latest Global Inclusion & Corporate Social Responsibility Report on the company's Corporate Citizenship webpage.